It's September 1st. Summer's over. Of course, here in San Diego, summer never actually started. Temps hovered around 68 straight through August. Surfers grumbled. Tourists shivered in their tank tops. Dogs demanded sweaters. San Diego dogs are seriously spoiled. I'm probably the only person in San Diego who isn't sad that September has arrived. Why? Because September is the start of fresh fig season, and you simply can't be sad when you see fresh figs. Figs are a sensual fruit. Their velvety soft skin emits a sweet, floral fragrance and often splits with juicy ripeness. They are the prized jewels of farmers' markets, and nowadays most major supermarkets sell them as well. 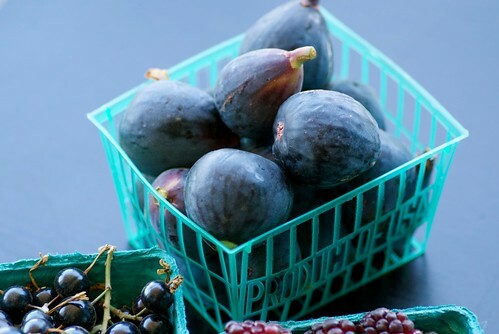 Figs are highly perishable, so buy them when you know you'll eat them in a couple of days. Otherwise, it's best to store them in an air-tight container lined with paper towel in the refrigerator for up to three days. Don't worry though. They'll never last that long. I don't care what San Diego's weather is like this September. As long as I have my fresh California figs, I'm good. Serve this salad in pretty cocktail glasses or serving dishes for a first course or atop a bed of mesclun or arugula for a larger plate. Burrata cheese is soft, fresh mozzarella cheese with a creamy center. It's available at Italian specialty markets, cheese shops and many major supermarkets. 1. In a serving bowl combine tomatoes, figs, and burrata cheese. 2. In a small bowl whisk all vinaigrette ingredients. Pour over the salad and toss gently. For fullest flavor, let salad rest for 30 minutes before serving and do not refrigerate. I have been waiting for fig season all year! Not that I can find great figs in this area, but I can manage to find a few! I'm thrilled for September to be here too, but more for the end of the heat then the figs. It's been in the 100s here. Although I do love my figs! This salad looks so easy and delicious. I'd love to find that cheese! I have been craving that salad ever since you tweeted the photo. Gorgeous! YUM. I just blogged about wanting to track down figs - they seem so uncommon here in the East Coast, or if I'm not looking in the right places. That recipe looks insanely good - thanks for the tips! Considering that I just ate one of those little baskets of figs. By myself. In one day. You could say that I'm excited about fig season! I love the sound of this salad. My next basket will be reserved for this! And the vinaigrette sounds lovely - I can't wait to try it on some melon. Another suggestion for fig fans is to combine a slice of fig with a leaf of fresh basil. I discovered this a couple of years ago and am totally hooked now. The basil really stands up to the incredible sweetness of my Blackjack figs (sweeter than the Black Turkey, IMHO). I've been harvesting since mid August and this week and next are crunch time. The Blackjack is a heavy producer and ripens over a long time (> 30 days)plus it's semi-dwarfing on its own rootstock. That makes it easier to prune and to net. Gotta have the net if you want figs, otherwise the birds win. Did I mention the ants? Tanglefoot around the trunk is the only thing that keeps them out. If you buy figs at the FM, thank the grower for their hard work. We love figs! They are so delicious in a salad. I like them with spinach and roasted almonds. I've never had a fresh fig. The only fig I've eaten came in a fig newton. Would love to have a fresh one though. Out here on the prairie they are hard to come by though. Hmmmm...never thought of putting figs with tomatoes for some reason, but I'm a HUGE burrata fan so think I'll have to give this one a try! I adore figs, and sensual they are. This salad looks like the perfect way to showcase their flavour. figs are the best! i love them and they are a few of the things that keep me reconciled when summer moves on! i just bought a large bag full! just love your salad idea susan! jessica- Even a precious few will do. megan-Since burrata has become more popular recently, more and more stores are carrying it. If you can't find it an Italian or cheese specialty shop or supermarket, then ask a manager. They may be able to order it for you. elra-It's lovely on a tomato and cuke salad too. erin-Figs aren't as plentiful on the East Coast, but I know you can get them. Trader Joe's sells good ones, and I'm sure Whole Foods has good ones too. jennifurla-If you'd like more baking ideas, check out my recipe archive. Under "cakes and pies," I've got two lovely fig cake recipes. anna-Funny you should mention melon. I used that mint vinaigrette on a melon and fresh corn salad last night. It was so light and refreshing. Enjoy! ramblingtart-See what I mean? It's contagious! mykitchenintherockies-WIth spinach and almonds? Oh, I've got to try that. Thanks for the delicious idea! suzanne-Since figs are highly perishable, they're also hard to transport. But you might want to check an online source such as Melissas. Everyone should experience the bliss of eating a fresh fig! sues-I love the fall too! cakelaw-Thank you! Their flavor really shines in it. meeta-A whole big bag? That's what I like to hear! val-I'm sure with all the great markets in Vancouver you'll be able to find some burrata. Good luck! I think I might have involuntarily licked my lips while reading this post. I love figs. LOVE them. And they're around for such a brief time too! Your salad is lovely. We never get figs that beautiful here on the East Coast. This is just another thing I can use to bug my husband to move to Calif. for! He LOVES figs and would go crazy for this salad with the burrata cheese. What gorgeous pictures. 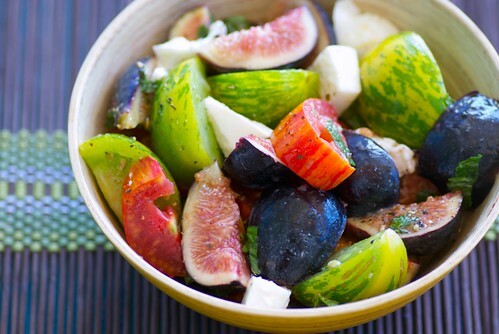 I love figs for making jam and now I have another idea with this cool fig salad. I love, love, love my fig tree. We get figs from it every August so our season has past. Not much can top a good fig. My grandfather had 6 fig trees and I would literally wait anxiously all summer in anticipation of all the figs we'd have!!!! I just bought fresh figs for the very first time last week - and it turns out I love them! I hope the fig season doesn't fly by too quickly so I can crank out some more ideas on how to use them. Pairing with tomatoes - never would have thought of that! Excellent suggestions here! and makes me miss sunny Coronado! I was just in Washington DC eating delicious figs wrapped in Iberico ham from Spain not to be missed! Here in DC it's as though a switch was flipped and we went from 100 degrees and humid to 80 and dry just in time for Labor Day weekend. I love it. And I love this salad idea. The little tomatoes look like miniature watermelons. Lately I've been addicted to peach and heirloom tomato salad with feta, basil and balsamic. This may pull me away though! Looks great. Ha! We're only going INTO summer here in SA – which means I'll soon be able to make your absolutely delicious-looking salad. Another winner. jane-Ha! You should use it. The figs are divine. In fact, my dad from RI just said yesterday, "We don't have figs like that here!" debbie-Your own fig tree? Lucky, lucky girl! They're positively ambrosial. foodhunter-Well, you can just make this one then! naturalselection-Figs and Spanish ham? Oh, yes, indeedy! sara-I'm so happy to hear it! Welcome aboard! holly-How about we switch? I'll be trying your peach and feta salad next! I have a tough time finding figs in my little corner of the world. I sure would love to. What's a "almost-as-good-as-the-real-thing" dried version? sunita-They are happy food, indeed! rosemary-I always used to buy dried figs at Italian specialty markets, but organic markets have a good selection too. Just keep in mind that dried figs are completely different than fresh. They're much harder and chewier, and the flavor is more concentrated.